Spain is the world's 14th largest economy and ranks 5th within the EU. With 47 million inhabitants and after some stagnation between 2008-2012, Spain’s economy is steadily speeding up and has achieved one of the strongest growths in the Western World. In 2011 the country ranked 44 in the World Bank ranking by countries in terms of business climate, and in 2017 Spain has climbed to the 28th position in the list and is ahead of countries such as France, The Netherlands, Switzerland and Japan. 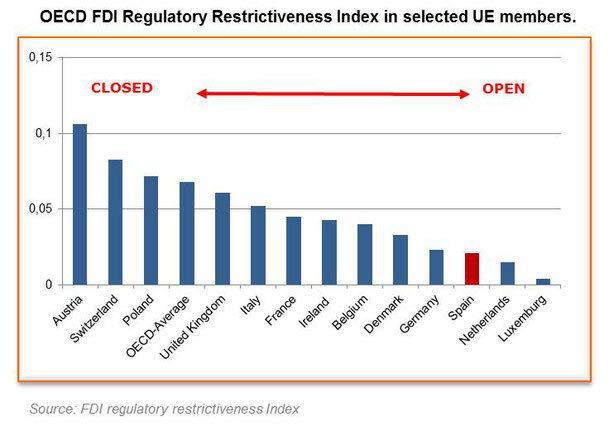 Additionally according to OCDE FDI Regulatory Restrictiveness Index Spain ranks 9th most open country to foreign investment. Spain’s attractiveness for foreign companies is not only about the domestic market but also the possibility to reach Latin America and North Africa via Spain. 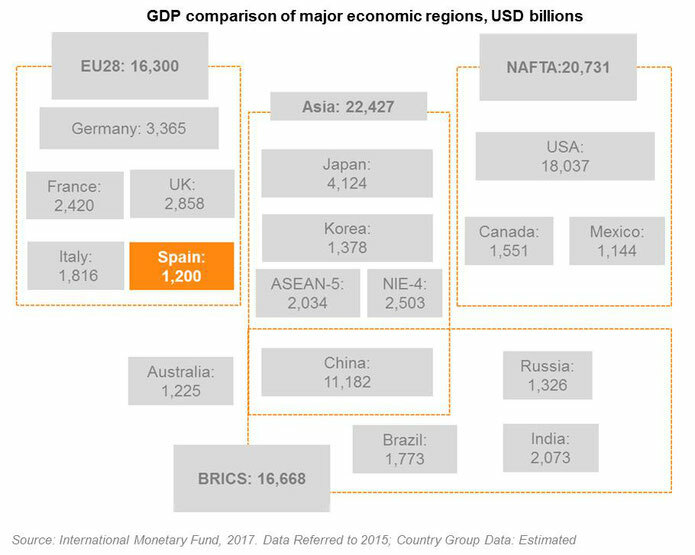 Thus Spain is the world’s 12th largest recipient of foreign investment with a highly internationalized profile of its economy. PragmatiQ offers companies that want to enter the Spanish market a "soft landing". A cost-effective shortcut directly into this often "forgotten" market where a professionally made analysis combined with providing relevant contacts with the best possible local partners are decisive parameters. Internationalization is much more than selling abroad, it is part of a long-term strategy that includes substantial changes in the corporate culture. In this never-ending process, managing global information is crucial. As is a constant review and recycling of ways of doing things, ensuring that the right staff are always in the right place and being constantly open to change. Choosing the right go-to-market strategy without ensuring the right kind of cooperation with the right partner is without exception an expensive disappointment. Very rarely the first most promising or obvious local contact is the one that will be the best in the long run. In this early and decisive process, PragmatiQ, thanks to its great local knowledge and strong local networks, enters as your partner and pave the way for a successful expansion. In addition to leading you on the right track in this huge market, we can also assist with all the help needed for setting up your own branch. PragmatiQ has favourable cooperation agreements with prominent partners in business law and market research to mention a few examples. Being internationally competitive is much more than offering a good product at a competitive price. An internationalization process, as said, is complex and extends far beyond a desire to "sell abroad". We are talking about a medium and long-term strategy, not about a "quick-fix" in order to compensate a declining home market. Avoiding improvisation is fundamental because there is rarely a second chance. Successful internationalization is always a result of careful preparation. This preparation often corresponds to at least 70% of the resources allocated for internationalization. As a result, PragmatiQ targets companies that are prepared to make the investments necessary for proper positioning in the new market and that have a corporate mindset that promotes medium and long-term projects. ICT and telecom, finance, raw materials, manufacturing, medicine and chemical engineering. The "Nordic" brand is strong in Spain. Spain is the second largest car manufacturer in Europe and is ranked ninth in the world. It is also the leading European manufacturer of professional vehicles. Spain is one of the world's leading countries in the development of renewable energy, consequently there are many opportunities for cooperation with Nordic players. About 2.000 companies are active in this sector in Spain. Although most are small and medium-sized companies, there are several major players dominating the domestic market. Of these, many have made significant expansion abroad. The Spanish biotechnology industry is an industry that has grown strongly in recent years. Here there are great opportunities for fruitful cooperation between north and south. The information and communication technology sector in Spain has over the last decade become one of the fastest growing in Europe and Spain is now counting as one of the top five countries in the region. MedTech and FinTech are particularly interesting sectors. PragmatiQ tailor every mission according to the client's needs and challenges. Our head office in Madrid works in close connection with our office in Stockholm and /or our partners in the other Nordic/Baltic countries. By ensuring a physical presence in the field, both in Spain and in the Nordic countries, we can continuously provide the client with a direct feedback from a local representative and in the native language. This part of the process has proved very important and meaningful for the final result. From the very first day PragmatiQ deploys a practical focus. First an evaluation of the contractor's prospects of internationalization takes place. Once this is in place, we devote ourselves to setting a strategy and finding business opportunities with quality and substance that allows the client to achieve lasting sales on the new market. Whether via traditional channels such as direct sales, distribution, agents and/ or through public procurement on their own or through joint ventures. Towards the end of the assignment we will make adjustments according to need. PragmatiQ can also remain as a local resource in the market, on an hourly basis, even after introduction and launch is completed.